← How to convert MS Office Excel documents of XLS to PNM? How to convert MS Office Excel documents of XLS to PPM? PPM is kind of 24-bit color image which is formatted using a text format. PPM format stores each pixel with a number from 0 to 65536, which specifies the color of the pixel. The file format also stores the image height and width, whitespace data, and the maximum color value. With the help of docPrint which is an application of docPrint Document Converter Professional, you can convert MS Office Excel document of xls to ppm or xlsx to ppm easily. docPrint is a Windows printer driver that saves ink, paper and time by controlling printed output. It supports to print 2, 4, 6, 8 or 16 pages on a single sheet of paper. It also supports to scale A0, A1, A2, A3 papers to standard Letter or A4 paper sizes. docPrint is also a document converter which can convert any printable document to 50+ graphics, it may be a Microsoft Word file, Adobe PDF file, HTML file, Excel file and others. docPrint supports various image formats, resolutions and compressions. docPrint is easy-to-use, just print a document to docPrint, you will be able to start using Document Printer software. If you want to use docPrint, you should download docPrint Pro at http://www.verypdf.com/artprint/docprint_pro_setup.exe and install it on your computer. 1. Run the printer driver. You should open an Excel document and click “File”—“Print” to open “Print” dialog box in which you can choose “docPrint” as the current printer in “Printer” combo box. Then please click “Print” button. The hot key “Ctrl”+ “P” will also do you a favor to open “Print” dialog box. If you have set docPrint as the default printer, you can right click the Excel document and choose “Print” option to run docPrint directly, which is more convenient. So setting docPrint as the default printer is recommended. 2. Open “Save As” dialog box. In the popup “docPrint” window form, you are able to see some function buttons in the toolbar and a small dialog box named as “Option Settings” on the right. Please don’t care about them if you want to convert xls to ppm only. 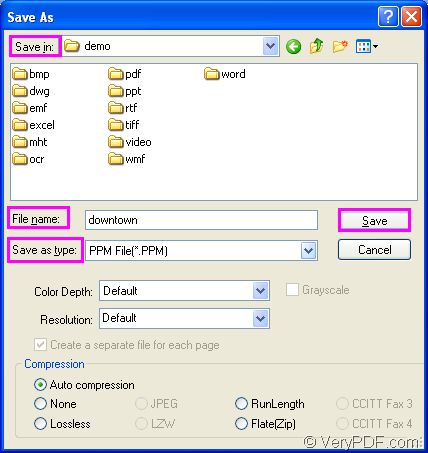 Just use one of the following methods to open “Save As” dialog box. The first is to click “File” and click “Save as” in dropdown list. The second is to click the button which looks like a floppy disk in the toolbar. The third one is to use the hot key “Ctrl”+ “S”. 3. Save the target files. For completing the conversion from xls to ppm format file, you should follow the operations one by one in “Save As” dialog box which is shown in Figure1. Firstly, please choose a suitable location for the target files in “Save in” combo box. Secondly, you should input the name of the target file in “File name” edit box. Please choose the right output format for the target files in “Save as type” combo box. Then please click “Save” button. Then the conversion from xls to ppm will come to the end and you will get the target files in specified location. Please see the target files by some kind of image viewing or editing program. How to convert documents of Microsoft Office Excel to PPM? How can I create high quality DCX files from a Word document? How to convert documents of Microsoft Office Word to dcx? How to convert Word to EPS file via command line? This entry was posted in docPrint Pro and tagged xls to ppm. Bookmark the permalink.